Salt Spring Island...a foodie paradise...plus! 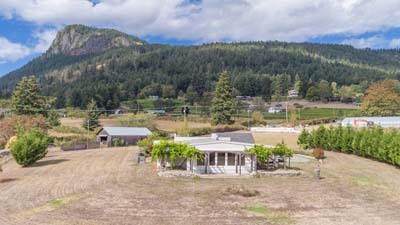 Are you thinking of buying an arable acreage on Salt Spring? Interested in being self-sufficient? Wanting to be a part of the organic foodie revolution? Call me, and let's look at some opportunities that will suit you. Salt Spring Island seems to naturally fall into four categories. Yes, the island is an authentic artists colony. That creative and discovering mindset, offered by the artistic vision, does inspire the community. Salt Spring is a very interesting place to live. It's also the home of differing (yet caring) opinion. Painters, musicians, writers, potters, ceramic studios, actors, dancers, sculptors...ArtSpring, ArtCraft, galleries, studios. A scenically beautiful place (this natural splendour has been maintained by the Islands Trust, a government body put in place in 1974, to "preserve and protect" the environmental beauties of the Gulf Islands, for the benefit of all B.C. residents), so that one enjoys park reserve green spaces, walking/hiking trails, kayaking and sailing discoveries, and a care for flora and fauna. The appreciation of the natural world is a part of the Islands Trust preservation model of governance. The resurgence in small farming enterprises, with an organic basis, and with a view to having the Island once again be able to serve itself with food production, is an integral part of the community. Vineyards, olive grove, orchards, veggie and berry market gardens, Farmers Markets...opportunities to learn new techniques. Alternative health practitioners offer wellness opportunities...looking after body, mind, and spiritual outcomes...a holistic model. There is a hospital and traditional medical offerings, of course...plus alternative methods. Four distinct aspects...creates a solid chair of support for islanders and for visitors. Are you thinking of buying a property on special Salt Spring Island? Please call me. Successfully connecting buyers with sellers since 1989, I look forward to bringing my knowledge (of both inventory and of market trends), and my expertise, to your benefit. A full-time and full-service realtor, your best interests are my motivation.